Life is an adventure at any age! 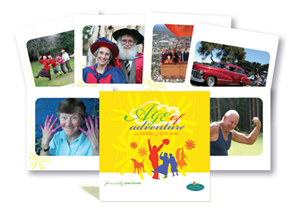 Welcome to Age of Adventure, a delightful, photography-based card set that celebrates the energy and contribution of older community members. These vibrant full-colour photographs explore the many ways in which seniors engage with their communities, relationships, daily routines, and their intellectual and physical endeavours. Use these 50 full-colour cards as conversation prompts and a challenge to the stereotyping of older community members. The images can be used to encourage young people to consider the life choices they make and influence their road toward later fulfilment. This versatile card set can also be used to promote better understanding between the generations, both in communities and within families. Age of Adventure sprang to life when we asked people to submit photos capturing aspects of active and positive aging. The results were whimsical, funny, thoughtful, touching, zany—and definitely optimistic! Families, teachers and health workers: check out the Age of Adventure booklet and Idea Banks to discover how you might use these cards for storytelling, creating conversations, and enhancing life-direction.